Can You Close a Credit Card Without Hurting Your Credit Score? Before you snip that card in two, understand that there is more to closing a credit card. If you’re looking to close a credit card without hurting your credit score, think about these important aspects to do it right. Although you may want to cancel that credit card, you have to ask yourself if you should. Eliminating one more source of fees that you don’t need sounds great, but it might not be the best move. Canceling a card could help you avoid annual fees or high interest rates. Closing a card could reduce your available credit and average age of your accounts, therefore decreasing your credit score. You may need to open a new card before you close another. There are many valid reasons to cancel a credit card. Perhaps you don’t want to be tempted to spend excessively or the terms of your card are no longer friendly. Essentially, you cancel cards that are unnecessarily costing you money. Before closing your account, though, you can request a lower interest rate from the card issuer. However, they may not respond favorably. Annual fees are often a reason to cancel a card, especially if the issuer won’t waive the fee. Opening a new credit card can also be a good reason to close one of your other cards. This is only a good idea if you get a great deal when you sign onto the new card. Understand that if you’re closing a card to try to help your score, taking all the right steps doesn’t necessarily mean your score will improve right away. Payment information may stick around for a while. So if you had some late payments on the now closed card, they won’t just disappear. Potential lenders look at your credit utilization ratio. Included in the ratio is how much credit is in use and how much credit is still available. So, if you cancel a card with a high limit, it will significantly affect your ratio. In turn, it could hurt your credit score. Your score is especially at risk if you have high balances on other cards. To make sure closing one account doesn’t impact your score, pay off the balances on all other cards. Zero balances means a credit utilization ratio of zero, so you won’t feel the hit of the loss of a balance. You also need to consider the age of your accounts. Old credit is good. If the account you want to close is older, it will decrease the average age of your credit and be potentially harmful to your credit score. Closing an older account could have a negative impact on your score. 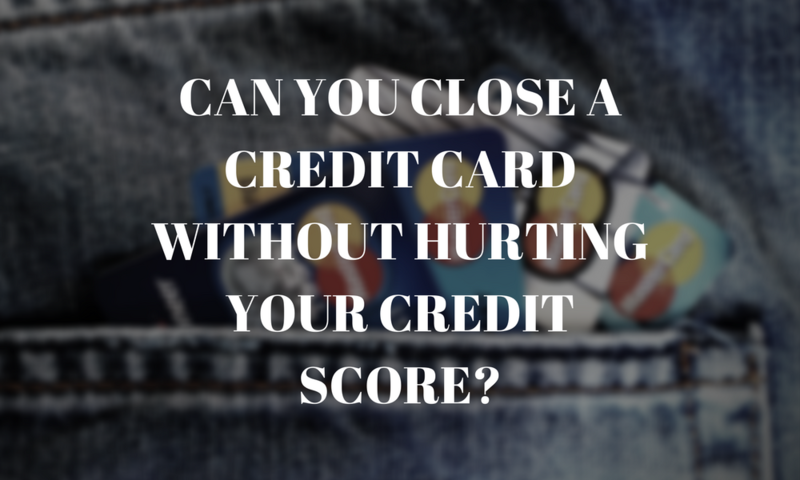 Do you have any questions about how to close a credit card without hurting your credit score? Give us a call at 1-866-991-4885.